Humour in artificial intelligence agents: Yah ! Crowd Goes Wild ! Yah ! Crowd Goes Wild ! 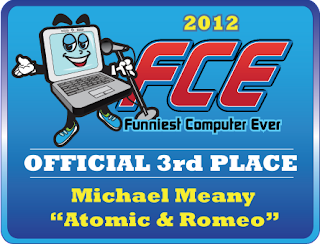 Atomic and Romeo won 3rd Place in the Funniest Computer Ever Competition. Congratulations to Steve Worswick and Owen Niblock, and to all the contestants. Also, thanks to Dr Sam Joseph for organizing this truly funny, funky, and engaging event. Onward and upward for next year. Either way - well done, that is a major achievement. Either way, well done - that is indeed a major achievement! Either way, that's a major achievement, well done all round.